I'm not taking any quote out of context -these are New York Democrats who have nothing supposedly to lose by embracing their party's leader, President Barack Obama. Yet, some are running away (or at least shying away) from embracing the leader of their party. Wonder why? What the Brooklyn GOP has accomplished in recent elections might be the answer. Or at the very least, focusing on the President's record of failure and "leading from behind" may have something to do with it. Democratic Assemblyman Harvey Weisenberg of Long Beach, tells Azi Paybarah he's not sure if he'll vote for Barack Obama in November. "Well, I can't answer that until I hear what the other guy has to offer. I am going to vote for him? I don't know ... Obama, nationally, I think he's in trouble. People vote their pocketbook and people are suffering." "I don't believe things are getting better, because it appears to me there are more people in trouble then ever before." 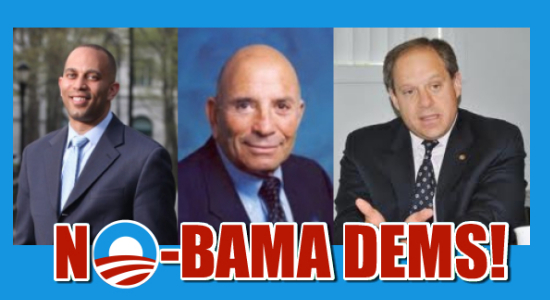 Democratic Assemblyman Hakeem Jeffries, running for congress against Charles Barron and Alan Bellone in NY-8, told Yochonon Donn and Yosef Rapaport from Hamodia that he only shares one thing with President Obama: his Birthday!!! Queens Assemblyman Rory Lancman, and a Democratic congressional candidate from NY-6, appeared on "The Bibi Report” - an online radio show that purports to reveal “The Truth on Israel and the Netanyahu government” in September. He made clear then that if he ran for Congress, he wouldn’t be tripped up on questions involving the Obama administration and Israel. Although Lancman had high praise for the President’s address to the United Nations, he said that President Obama seems to have forgotten the sympathy he exhibited towards Israel back when he was Candidate Obama. Using the harshest words of criticism articulated by a Democratic party member, Lancman expressed a great amount of concern on the president's dealing with the issue. "I'm very concerned, that the President's framework for ultimately resolving the Iran- nuclear question is: 'OK, i will let Israel go and attack Iran.' I think that is very unfair to Israel, both in terms of us not potentially sharing in that burden. But it also further stigmatizes Israel in the world,. in a way that is very unfair and dangerous for Israel and Jewish citizens everywhere." Nice job TJK. Way to pick up on this - I know I missed it totally. Let's talk about this on tonight's show. OK, right after i'm vetted by the Guys!! !